This post is both a response to Gary Stager’s indictment of interactive whiteboards (IWBs) over at Tech & Learning and a cross posting of a few resources that I shared earlier this month in a piece I did for the NEA Member Benefits website about creative use of IWBs in the classroom. I have a confession to make. About 4 years ago now I fell in love….with my interactive whiteboard. At first it was a mere infatuation, enchanted by all the fancy bells, whistles, and gadgets. As I begin to construct interactive lessons using the built in software I became smitten with the ability to drag and drop any type of media I wanted into my interactive workspace. My students were able to make notes and annotations next to rich media. Class discussions and notes could be saved digitally for the next day, week, or until the end of the unit for reflection. Truly integrating disparate resources into one work space by tying imagery, text, video, and the ability to concept map over and with all of it became addicting. Student-discovered resources could instantly be cut, copied, and pasted into the work space, and to cement my new found love of my IWB, students could interact with the content directly in small groups, or individually. They could explore concepts visually in ways that would take me much longer to construct either online or using traditional methods of whiteboard markers and construction paper cutouts. 4 year later, and my love hasn’t decreased. Even now as I work primarily with teachers, conduct workshops, and produce screen casts for district resource sites, I rely heavily on my IWB tools, and while many educators may deride interactive whiteboards as overly expensive and completely unnecessary additions to the 21st century classroom, if used in a truly collaborative, and practical way, the over-grown electronic tablets we have in the front of our classrooms can offer experiences that are difficult to duplicate with traditional whiteboards or just video projectors alone. Here are 3 practical ways to start falling in love with your board! Use the board as you would your plain old regular whiteboard but with one difference. SAVE the notes! Most IWB vendors include software that serves as a blank canvas for creating presentations and taking notes. Encourage your students to come up and jot down a few discoveries they make during independent work time or notes that might help the rest of the class on a particular topic or project. Save the notes at the end of the class—you now have a digital record of the day’s learning! You can then use it as a way to check for understanding throughout your learning, revisit conceptions and how they’ve changed, our publish them as a PDF and post to your website to share. Many elementary classrooms still eat, sleep, and breathe center based learning. It’s a great way to get students to work in small groups, focus on a task, and provide the teacher with an opportunity to work one on one or with small groups of students to better evaluate how students are progressing with various learning concepts and goals. Most of the IWB vendors now have interactive resource and lesson sharing communities to help teachers find new ways to use their boards. While many of these lessons are already tied to teaching standards and often include many engaging activities, interactive assessments and tutorials for building your own interactive lessons, they also work great for learning centers. An example of this would be a review/reinforcement game I made for my Promethean Board on whether or not something is technology. 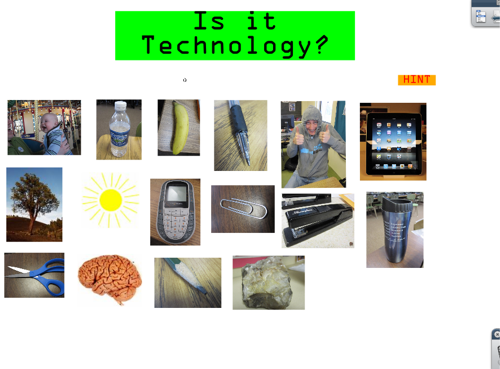 After a few lessons with the 3rd graders talking about what defines technology both in their eyes, the formal dictionary definition, and what society generally defines technology as, I then had them play a small game I called “Is it Technology”. While it is a rather rudimentary digital version of a worksheet, it does have some interaction in providing feedback to the kids, I didn’t have to search the internet for something that “basically fit” what I wanted, and the tools that came with my IWB made it possible for me to create the interactive just the way I wanted it. Not everyone can dive right into the software and create interactives like this, but I believe there’s great value in being able to shape the experience and allow the students to directly and physically interact with it using the IWB. All of the sites listed below have great resources for your particular software and IWB to get you started finding already made, teacher-published interactives for use with students, many of which work great as learning center activities. Promethean Planet – Download interactive “flipcharts,” search through interactive web links and find images, sounds and movie resources in downloadable resource packs for Promethean ActivInspire software. SMART Exchange – Download SMART “notebooks,” connect with other teachers and find lessons tied to your standards. You can also create notebooks online using the SMART Express site and then save them directly to your computer. WizTeach Share – A fledgling teacher community for those using the interactive WizTeach software. Download lessons, contribute lessons you’ve made yourself or visit the forum to discuss with other teachers. This one seems a bit flaky to many educators, including myself at times. In a perfect world, it would be great to have any physical math manipulative and of piece science equipment available in your teaching toolbox. Sadly, school districts can’t provide the equipment and manipulatives to ensure that every learner has something they can physically hold, manipulate, and experience firsthand. That’s where virtual manipulatives come in. If you can’t provide something tangible for the students to work with, at least you can bring virtual science and math tools into your room, and at least allow the students to interact with the virtual tools. I regularly brought virtual math counters and other manipulatives into my computer lab with younger students to practice patterns, number sense, and other concepts. They were able to all work on their computers using mice to move the little virtual cubes and marbles. Bringing the virtual tools to the IWB, making them larger than life size, and then allowing the students to manipulate them in front of the rest of the class was a HUGE plus to both engagement and discussion. Not only would students spend more time working through a concept, but they also wanted to “show off” to the rest of the classroom. Small groups were also invited to come and work with more complicated tools while students were working independently. Math Playground – Lots of tools for exploring measurement, fractions, and geometry. Word problems, math puzzles, and math videos are included, but watch out for some of the advertisements as they look similar to some of the tools. Virtual Manipulatives from GLENCOE – Virtual base 10 blocks, cubes, and a few other traditional manipulatives. No advertisements here, yay! Gary Stager and several others are very quick to point out just how easy it is to misuse an interactive whiteboard by turning it into a glorified projector screen, or allow it to become a teacher tool that students never get to interact with. Perhaps the worse indictment is that IWBs tend to be used only for very low level teaching and learning with more emphasis but on the “flashy” aspects of interactive lessons, and for the most part I agree with this. However, like any other tool, there are certain ways to use it most effectively to enhance what’s happening in your classroom. Not only that, but as teachers focus on the flashy stuff, they often forget about the simple stuff that makes using a regular whiteboard such an important tool; to be able to quickly capture thoughts, comments, and examples from students on the board (yes, most times even faster than fancy clicker systems). The advantage of the IWB is being able to take those notes and make them transportable via screen cast, print to PDF, or share on the web. Being able to build a unit long, classroom journal using the tools and encouraging students to interact with it can help guide classroom discussion, and provide a bit of engagement for more traditional classroom exercises. If you agree that your IWB could be put to better use, and have some examples, share away! If you disagree, I’d love for you to share even more so! I personally feel the tool has been both derided and underutilized in many schools, each situation fueling proponents for the other side. The tool really hasn’t come into it’s own yet, and still has some untapped potential, and I feel the tool can be used to bring people closer together, rather than come between the learner and the student. Previous:Write a Poem, Win a Lenovo m90z ThinkCentre! What a great read! I NEVER want to go back to a classroom without my Promethean Board. I look forward to the new adventures that await me and my students in my classroom everyday! ActivInspire is such an awesome program to work with. I also love using it with interactive websites on the internet such as SpellingCity.com and BrainPop.com! Thanks for writing this and sticking up for us teachers who use the IWB in lots of meaningful ways! I’m with you, Tyler! I’m working on a few lessons right now to give to other teachers to use, and they’re all IWB based with student interaction a must! Considering making this my default lesson plan template, then link to other resources for non IWB materials, at least within my own district. Thank you for posting this article. I too am a long time fan of IWBs. I was disappointed by the backlash of non-fans regarding this technology. If you don’t want to spend the extra bucks on one, don’t trash it. I don’t mind when people share best practices for technology, but trashing technology just for the sake of trashing it is upsetting to me. Different educators use different tools to get their point across. I think IWBs are a great interactive tool and serve different learning styles…especially kinesthetic learners. Thank you for the supportive iwb post. I really get exhausted with the iwb bashing…frequently from people who either never took the time to see its potential or never had one. I have been teaching for 30 years and have enjoyed the last 3 more than any others due to the challenge of utilizing my iwb to engage my young learners. I love how visual math becomes with the interactives. We save class notes all the time and help students spiral their learning with the review from our notes. The recorders allow for documenting math procedures for later referral and if posted on website can even help parents stay informed. I would challenge those who see it only as a glorified projector to simply find a teacher who loves her/his iwb and go visit. To be fair, some of the IWB bashing is in response to terrible uses of IWBs. It’s SOOO easy to abuse these tools, that the idea of “best practices” can easily become nothing more than a glorified electronic worksheet. I think the use of the screen recorder, capturing student notes, and using the IWB as a digital “think space” is where the true value comes in. Vielen Dank ffcr all eure Kommentare. Mich freut es ganz besonders, dadf Englisch wohl doch kein Hindernis ist bei den Blogbeitre4gen mir wurde ne4mlich schon der Mischmasch zcewshin D und E in einem Blog vorgeworfen..Ich freue mich auch besonders, dadf diese Pre4sentation zur Diskussion fcber den Einsatz und Nutzen von Whiteboards ffchrt, ich stimme Rene vf6llig zu, es we4re ja auch nicht schlimm, wenn es erstmal die Tafel ersetzt und die Leute dann merken, dadf es ja viele Vorteile hat nur wird der wahre Mehrwert erst dann erschlossen, wenn man schon a priori andere offenere Lehr-und Lernmethoden nutzt. Das ist genau wie mit Moodle und anderen LMS: es kann ein Datenablagesystem bleiben ffcr Old School oder es kann zu einem offenen virtuellen Lernraum werden ffcr New School. Ich bin der Meinung, dadf von vornherein schon darauf hin gearbeitet werden sollte, dies alles sinnvoll einzusetzen, weil sonst die Gefahr besteht, dadf die Kritiker recht bekommen, die die Meinung vertreten, dadf dies alles nichts Neues ffcr die Bildung bringt. I enjoyed reading your post on IWB. I use a board called a Mimio board and I love it! The continuation of notes is so helpful and allows me to review and revisit lessons instantly. After teaching with an interactive white board, I can’t imagine anything else and I hate the days when the computers are not working. I worry that I am not using the board as effectively as possible and that there is so much more I could be doing to fully take advantage of the opportunities an interactive white board provides. I continually look for more ideas of effective usage, and I hope I am not letting a great tool with so much potential go unused. Ben, I completely agree that Interactive Whiteboards are extremely beneficial in the classroom, and can create a much more efficient learning environment. I came from a high school and currently go to a college that both utilize Smartboards, and despite a few calibration or alignment issues, the Smartboards are an incredibly useful resource. However, as I have been observing in field placements in city schools, I’ve noticed that they don’t have the funding necessary to purchase these types of technologies. How would you suggest a future educator like myself go about attempting to raise the funds to get these technologies? And if that’s not necessarily possible, what other resources might a low budget school try to use? That’s a pretty tall order, trying to find resources for technologies like this…however, in a lot of urban schools with a lot of poverty and higher rates of endemic educational problems the best bet is to look for some Title I dollars. It’s a fund specifically aimed at providing tools and resources for disadvantaged schools and student populations. Many schools use this for a lot of their technology funding, and will either have a Title I director, or someone who helps coordinate that grant effort. You could always look for some local community or education foundations that might be wiling to help out. We have several supportive parent organizations and educational foundations in our area that help with these sorts of purchases. If all else fails, talk with a vendor and see about getting a demo unit in your classroom. If you can show people how you’re using it to make your teaching more efficient and engaging who knows what kind of money you might be able to dig up?